Originally part of the same Track Diagram Series as Books 1 to 5, this title remains published by John Yonge and the Quail Map Company. The book covers all the railways of Ireland including the 3’ 0” gauge Bord na Móna, the LUAS in Dublin and certain private and leisure railways. 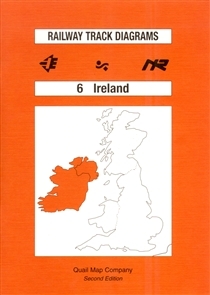 Now in 2nd edition (the first having been published in 1995).